The MWC event in Barcelona is being awaited by smartphone geeks with bated breath right now. One of the handsets that’s sure to be an attendant at this gala is the LG G8 ThinQ. This will also be the brand’s first phone of 2019, and leaks have already made us excited. However, the regular stream of leaks so far has provided us with some concrete as well as conflicting details about the G8 ThinQ. Let us delve into all of them to get an idea about what the forthcoming LG flagship will look like. The LG V40 ThinQ was hailed for its triple-camera setup, so it sounds logical for the G8 ThinQ to adopt it too. However, that’s seemingly not the case, according to the phone’s leaked renders. They show that the phone only holds two camera lenses on its back surface. One could guess that the main sensor will be accompanied by a wide-angle camera, which means that the telephoto zoom mechanism will be inaccessible this time. But there’s another report, which is not accompanied by any images, that states that a third camera sensor will indeed be present on the new LG handset. We’re betting our money on the dual setup, as it’s something that has appeared on two sets of leaked images till now. Before the LG V40 was launched last year, there was a talk about the implementation of a face unlock functionality on it, but it didn’t make the cut. But if you zoom into the notch of the G8’s leaked images, you’ll be able to see that there’s much more stuff going on here than just a dual front camera system. We can’t exactly place what the sensors are meant for, but a wild guess would be that they exist to serve a hardware-based face unlock functionality, a la the iPhone. 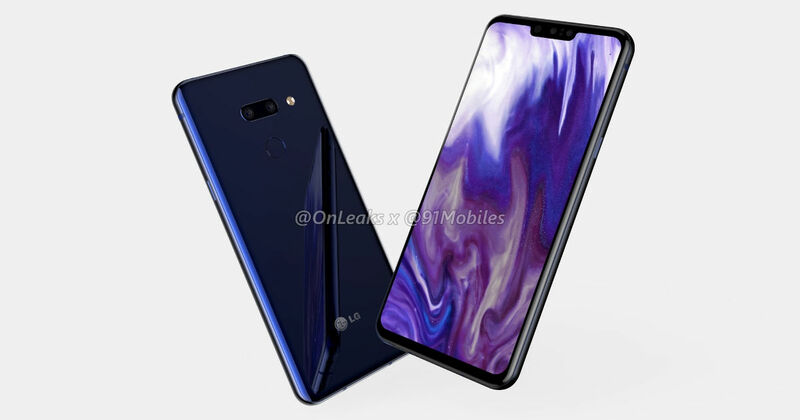 Leaked renders have speculated that LG has adopted a traditional notch for the G8. This cut-out will apparently be sitting atop a 6.1-inch display bearing an aspect ratio of 19.5:9. But the biggest highlight is that this panel purportedly has 4K resolution. This will be an overkill, and honestly, we’d advise you to take this news with a pinch of salt. The same report also says that this panel will be of the LCD type, and not OLED. Why LG would ditch OLED tech to offer a higher resolution is something difficult to grasp. This is a farfetched idea that’s not likely to make the cut, but at one point, LG is reported to have worked on a second screen attachment. It was supposed to act as a case, but double the size of the screen in the process. There has been no recent talk about this feature, so we expect LG will have reserved it for later smartphones. With the aim of maximising the display area on the front surface, a few companies have implemented the sound-emitting display concept in the past. If the rumours are true, the G8 ThinQ will also adopt this tech. Its ‘sound on display’ speakers may use vibration and bone conduction to have the sound come directly from the display. And there’s a high possibility of this happening since the leaked renders do not seem to show an earpiece module at the top. With the ‘sound on display’ technology intended to act as an earpiece and a second speaker, a grille at the bottom of the device is likely to house the secondary speaker. This bottom area is also occupied by a USB Type-C port and a 3.5mm headphone socket. The left spine of this phone will hold a power button and a SIM tray, while the right side will feature volume rockers and the Google Assistant button, as per the leaked renders. LG announced recently that a 5G smartphone with the Qualcomm Snapdragon 855 processor at its heart is indeed on the cards for this year. So there’s a good possibility that the G8 ThinQ will be that phone. However, there is another report saying that LG’s 5G phone will be a different device altogether. That means the Snapdragon 845 chipset is what the G8 might be settling for. A recent leak had certification documents from Brazil reveal that the phone might opt for a 3,400mAh battery. Although not large enough by today’s standards, this is still the biggest battery to have been pushed into a device in the G series. LG has scheduled its press conference at the MWC for February 24, so that’s when we expect the LG G8 ThinQ to be unveiled to the world. We’ll be bringing you all the latest from the much-awaited event, so stay tuned. Sohil is into a lot of things, which is why he's always short on time for everything else. He's an amateur photographer, an avid gamer, an ardent reader and a sucker for good movies and TV shows. He's been writing on tech for 6 years, and is in no mood to stop anytime soon.